Location intelligence is fast becoming an important component for most brands and businesses. According to LBMA’s Global Location Trends Report, nearly 253 leading global brands, including BMW, Tesco, Starbucks, Coca-Cola and Starhub among others are leveraging location-based technologies to connect with their customers. In the same report, 75% of marketers concluded that location-based marketing is an important business issue in 2016. Adding on, with the rise of programmatic advertising, marketing strategies with a solid physical context will gain importance to both marketers and marketing agencies. Thus, location based marketing will soon become a core component in marketing strategies. At Mobile Marketer’s FirstLook: Strategy 2016, an executive from Coca-Cola explained that brands that continue perfecting mobile-first advertising, location usage, payments and beacons will be noteworthy this year. 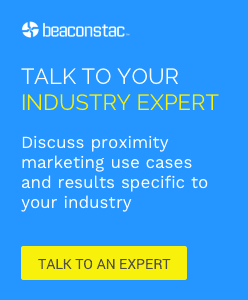 There are a host of technologies, from iBeacon to GPS to Wi-Fi that can be leveraged for location-based marketing. It is important that marketers and agencies know the workings and applicability of each of these technologies in order to select the best technology that suits individual business and marketing requirements. In this post, we cover the top 5 location-based technologies along with some interesting examples that can be leveraged for location-based marketing efforts. Wi-Fi today has almost become ubiquitous; with people using Wi-Fi for a wide range of actions from checking emails to interacting on social media to chatting with friends. This creates a good opportunity for businesses to leverage Wi-Fi for proximity marketing. With smartphones constantly scanning for Wi-Fi networks, stores and businesses can easily connect to their their target customers by offering free Wi-Fi. While customers can enjoy the free Wi-Fi, the store has the opportunity to broadcast its native advertising content like, promotions, coupons or even high quality product videos. This channel of marketing also provides a reliable way to capture the email addresses and contact numbers of customers; thus building a solid database of customers for future re-targeting initiatives. Proximity marketing through Wi-Fi also allows businesses to capture key customer metrics like footfall, frequency, average duration time in a venue, recency of visits among others. An interesting use of Wi-Fi based proximity marketing, was seen at the promotion of the Korean movie, ‘Berlin’. Unique Wi-Fi posters were used for this initiative and people walking near the poster were prompted to access the Wi-Fi network (called ‘Berlin free Wi-Fi’). When people connected to the network, they could watch the preview of the movie and could also book tickets for the movie. The traffic to the movie’s homepage increased by 28.5% and ticket sales went up by more than 60% during the period of the Wi-Fi promotions. Moving forward, brands can also use this channel to build their social media presence and create viral marketing effects by interacting and engaging with customers through the Wi-Fi network. Global Positioning System(GPS), is a satellite navigation system that identifies location information across the globe. Most smartphones today come enabled with GPS functionality, thus making them traceable across the globe. GPS location information from smartphones can be leveraged by marketers to send precise, hyper-local content to customers. GPS is most often used with Geofencing. Geofencing involves creating virtual boundaries around specific geographical locations, in order to send messages, or alerts to smartphone users within specified geographical boundaries. In essence, it creates a radius of interested customers. American outdoor products company, North Face ran an interesting campaign using GPS and Geofencing. As part of the campaign, people within a certain distance to the store received a text message that prompted them to visit the store. Based on the customer’s location, North Face tailored the text message to suit the weather of the region. Near Field Communication or NFC is among the much newer technologies that can be leveraged for proximity marketing. NFC enabled tags can be placed in specific venues or products in order to open a mobile browser (containing the marketing message) in an NFC enabled smartphone. An NFC enabled interaction simply requires the smartphone user to tap his/her smartphone to an NFC tag in order to receive the marketing content wirelessly. NFC is gathering traction as a proximity marketing channel and is being used in a number of locations like bus stands, shopping malls and subway platforms among others. As part of a proximity campaign, Samsung launched interactive NFC posters and kiosks called ‘Share and Go’ for the promotion of its smartphone – Galaxy S III. Samsung’s NFC enabled posters were placed at bus stops, train stations and airports and Samsung Galaxy S III users were able to download free music, videos, TV shows and books by simply tapping their phone across the NFC tag. NFC is also proving to be a great channel for proximity payments, with several leading brands already using the technology to process payments. An important aspect to consider for NFC is the fact that the smartphone user may need to have an app installed on his/her smartphone in order to interact with NFC tags. Another potential barrier is the fact that NFC requires the user to initiate the interaction, thus making it hard for brands to directly communicate with its customers as and when they want to. RFID (Radio Frequency ID) tags or chips can be tracked through radio waves and is one of the technologies that can be used for proximity marketing. An RFID hotspot is used to identify a passing RFID tag in order to trigger location specific content to the device owner. A distinct feature of RFID campaigns is the use of RFID tags or stickers that smartphone users need to attach to their smartphones in order to receive RFID enabled proximity notifications. In order to redeem the offers and coupons collected through such proximity campaigns, the customer would need to visit the store where the collected coupons were scanned. From a privacy perspective, RFID campaigns don’t necessarily store personal information of the customer, but tracks her/his in-store buying behaviour through an ID number assigned to the RFID tag. RFID stickers are light, easy to handle and can also be sown to clothes or products and is also used for inventory tracking and item identification. Recently, New York clothing store, Rebecca Minkoff used RFID touch screens in the store’s dressing rooms in order to identify the clothes taken by the shopper. The touch screen also gave the shopper the option of requesting additional items, different sizes/colours of the garment or assistance from the store’s sales staff. Apple revolutionised the proximity solutions space when it introduced iBeacon technology, that integrated location identification into iOS. Beacons are small, low-cost wireless transmitters that prompt contextual, hyper-local and personalized content directly to customers smartphones based on their specific location. Over the past few years, beacons have witnessed wide scale applications across diverse businesses and verticals from airports to retail to restaurants. Beacons are truly versatile and can be used for multiple use cases from relaying product information to sending coupons/promotions to gamifying customer experience through treasure hunts. The technology has witnessed significant adoption and some of the top brands using beacons include Starbucks, Macy’s, Target, Coca-Cola and Seattle Seahawks among others. Apart from delivering precisely targeted content to customers, beacons also also gather valuable customer insights. Some of the key metrics that beacons help gather include footfall, customer pathways, loyalty and engagement rates. In a recent example, American luxury department store, Barneys revamped its flagship store to include beacons. Through its beacon-enabled app, Barneys alerts customers when new editorial content is uploaded to the store’s in-house publication – The Window. Beacons are also used to send personal notifications and recommendations to customers based on their location in store, mobile shopping bags/wish lists as well as the content they recently viewed on ‘The Window’. Proximity marketing technologies have created an important shift in marketing. Traditional marketing uses a ‘push’ tactic where the customer is seen as a target, while today, new age marketing efforts focuses on using a ‘pull’ tactic, where the interest comes from an empowered customer. Given the host of technology options available, marketers and agencies should carefully consider the marketing objectives and choose a technology or a combination of technologies in order to create effective and immersive proximity marketing campaigns. Brands are also increasingly leveraging social apps with location technologies to drive in-store sales. Given today’s omni-channel nature of retail, beacons provide an excellent platform to observe and integrate a customer’s preferences across both physical and digital spaces. Moving forward, location is expected to become a core pillar (like mobile) across all marketing efforts. Location-based search optimization, loyalty integration and augmented reality is also expected to grow in conjunction with location-based initiatives. Ultrasound technology is missing. It’s a pity because it has strong assets. It’s universal: every smartphone has a microphone and will always have it. It’s transparent: the app activate the microphone. No action needed from the customer. It’s reliable: sound waves follow the shape of the place. No triangulation needed. Good post with great information about Location Based Services.I am impressed, its useful to all people thanks for this sharing for us and it’s an interesting article, I got the best information and best service from your blog, i am very glad to wish and sure its very helps.